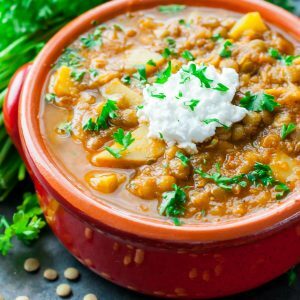 This healthy lentil soup channels the flavor of my favorite crock-pot madras lentil dish in a delicious vegan soup! It's also fantastic served over rice! 1/8 tsp cayenne pepper add extra for a kick! Heat a large pot to medium-high heat. Add olive oil and diced onion, and sauté until tender, adding the garlic towards the end to prevent burning. Next add veggie broth and diced tomatoes. Using an immersion blender, blend the soup until pureed. No immersion blender? No problem! Add the garlic, onion, and tomatoes to a blender or food processor and blend until smooth. Add the mixture into the pot with your veggie broth and get cooking! Increase the heat to high, then add dried lentils, diced red potato, and all your herbs and spices. Bring to a boil, then reduce to medium heat and cover. Cook for 30 minutes on medium [mine was on setting 4] then additional 10 min on low, to simmer. Top soup with a swirl of goat cheese, sour cream, or greek yogurt and a sprinkle of parsley. You can even add rice! Go nuts! I used Muir Glen's no salt added fire roasted tomatoes for this recipe. The flavor is stellar and the cans are BPA-free, which I adore. If you're working with what you have on hand, any 14.5 oz can of diced tomatoes will work for this recipe, if needed as well as pureed/crushed tomatoes, which are a great substitution if you don't have an immersion blender or would like to speed things along! Recipe yields 8-10 one cup servings or 4-5 bowls of soup. Enjoy!